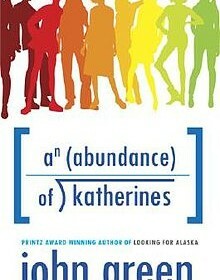 An Abundance of Katherines by John Green is a laugh out loud page turner that never had a dull moment. It takes place in a run down town in Tennessee called Gutshot. The two main characters are Colin and Hassan, both very awkward highschool boys. Colin is child prodigy grasping for the title of genius. Colin has been dumped exactly 19 times, all by girls named Katherine, and never takes the break up’s too well. When this happens, his best friend Hassan is always their to support him. Hassan loves “Judge Judy” almost as much as he is fond of Colin. Hassan is Colin’s only friend, due to Colin’s lack of social skills. Forgetting that he is lucky to have a bestfriend like Hassan, sometimes Colin doesn’t treat him with the respect he deserves. One day the two boys decide they need to forget about break-ups and drama, let loose and go on a road trip. One thing leads to another and Colin is laying down face first in knee high grass, while Hassan is trying to wipe up blood from a cut on Collins forehead. Along their way they also encounter Lindsey, who joins them on their journey. John Green never fails to entertain me. Every character is flawless in that each aspect is realistic and their thoughts are relatable to any teenager. This book is one of my favorites and will be one I re-read in the future. I would recommend it to any fans of other John Green books or anyone who enjoys a story filled with light hearted humor.